A box arrived today. Inside...copies of Pro Drupal Development hot off the press! In the picture I'm holding my youngest son. He's in the picture to show what an optimist I am. I assured my wife that writing a book would be no problem. Why, it would be done long before the baby was born. Er. We'll celebrate his first birthday in a few weeks. Permalink Submitted by Coba (not verified) on Sun, 2008-07-20 12:53. 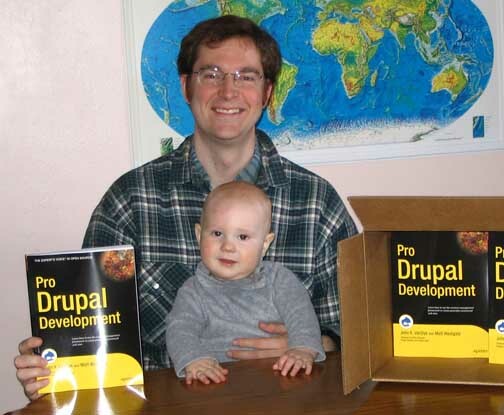 I just want to know whether this site has the right to resell your ebook at http://www.teramatics.com/Pro-Drupal-Development-Book.html. Thanks. Permalink Submitted by John on Fri, 2008-07-25 08:03. Let's see. We have the publisher selling the e-book for $31.49. Then we have a site based in Indonesia selling it for $15, and using a Paypal account to complete the purchase. No, my gut feeling is that they do not have the right to do so. Hopefully any honest person would recognize the difference.